Food. Glorious food. The ability to cook is just one of many things that separates us from the lower animals of the world—by which, of course, I mean college students . I'm lucky enough to have a decently well-stocked kitchen, but there's already room for a few more gadgets and gizmos for tasks that are still elusive. For example, a Home Pizza Maker Oven. The problem with trying to make a good pizza at home is that it's hard to get the crust properly crispy . You either need a pizza stone or a professional-grade oven; which, unless your initials are WHGIII you probably have neither the space nor money for. 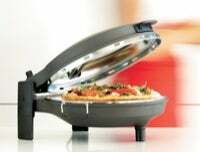 But the Home Pizza Maker Oven, which includes a removable stone base, only runs for about $120. Not only does it let you get your crust crispy—if you know what I mean—but the removable stone means you can use the oven for deep dish pizzas, omelets, and pancakes—that's all the major food groups right there. Plus, with a warm up time of five minutes and a cooking time of five minutes, you can have your delicious pizza in no time at all, with whatever toppings you desire. Finally, the banana and salmon pie I've always wanted .